Ismail was working in IT support when he decided he wanted to take his basic tech skills to the next level. 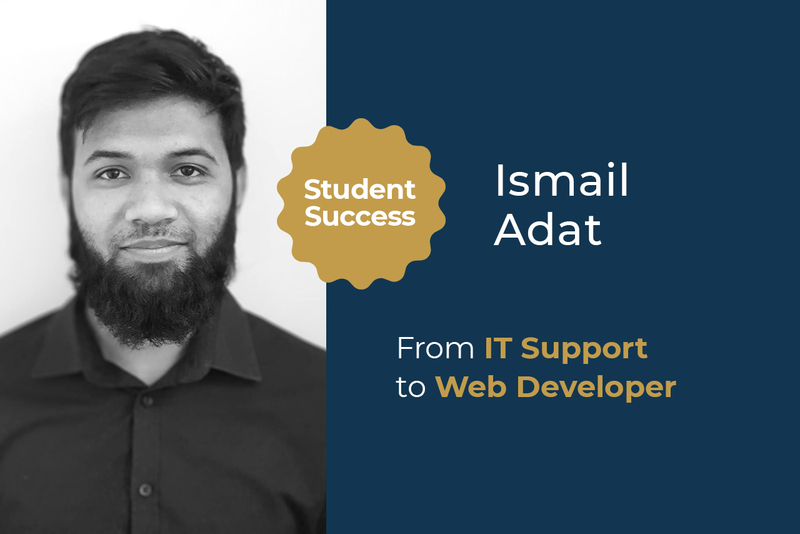 The Web Essentials course that Ismail completed gave him the confidence to be able to fulfil his current day-to-day responsibilities, fuelling his everlasting passion for technology and how it can create an impact in the world. Read more about what Ismail has to say about his HyperionDev course, his mentorship experience and what he’s up to today. I’m just an ordinary player in the game of life. However, I’ve always been fascinated by technology and how powerfully it influences our lives on a daily basis. I’m keen to develop programs and solutions that benefit others. Currently, I am part of a Web Development team that offers solutions and services to clients. Why did you decide on this course? I wanted to learn the basics of coding. I took a Web Essentials Bootcamp, though I see HyperionDev now offers a Full Stack Web Developer course. I love learning and trying new things. Has the course helped you achieve your new career goals and objectives? Absolutely. The course content was very much in line with what I do now in my day job. It’s also helped me tremendously with my freelance work. Even the basic stuff helped me a lot – for example, I had to make a simple contact form using PhP for work. The mentoring relationship is very different from a lecturing situation, which is essentially passive. The lecturer communicates the information, but the student does not necessarily grasp the concepts. With a 1:1 mentorship, the mentor communicates with the student every step of the way. This means that the student’s weak areas can be bolstered and he or she can advance much quicker. I can personally vouch for the mentorship process at HyperionDev. I honestly can’t answer that question. Overall, I found the entire Bootcamp really helpful. I love being part of something where I’m learning new things. I came across HyperionDev on a website while I was searching for a study programme. I needed to consider if I wanted to study part-time or full-time. Because I was simultaneously working, it made more sense to do something flexible and online. What advice would you give to people wanting to change careers to become developers? Because the world is constantly changing, it is essential to always be learning something new!